Heavily under-priced, Any looks at whether David Swallow should be in your starting squad. Swallow has always been earmarked as one to watch in the prism of fantasy sports, and for the better part of his six year stint in the top flight, he’s delivered. In his last 28 games at the top level, Swallow has averaged – most of those games coming in his breakout 2014 season. Obviously, the most attractive thing about Swallow heading into 2017 is his price. Realistically, most sides are going to opt with one medium priced midfielder to start the season with, and Swallow fits the mould perfectly. Having managed just half a dozen games over the past two seasons, whereby he averaged 85.8, Swallow is priced at an average of 58.95. His price puts him in the same category as other medium priced midfielders Jaeger O’Meara and Scott Selwood. Yet Swallow is $9k cheaper than O’Meara and $25k cheaper than Selwood. O’Meara is unlikely to dress up for the first few rounds leaving Swallow as the top candidate to hold down the sixth midfielder position. From all reports coming out of the Suns camp this preseason, in a bid to reach full fitness in the preseason, Swallow is training like a man on a mission. In September, the players’ holiday season, Swallow stayed home and trained. Of course, Swallow has been relevant before. His best season came in 2014 when he was a dual position defender. His average of 93.8 was the highest of his career to date and was indicative of the potential, and the consistency, of which is able to achieve. He scored above the 90 mark in 50% of his games and dropped below 70 points just once all season. But unlike 2014, where he could be selected as a defender, Swallow is only a midfielder this season. Yet if he does play, he could be a chance of moving to defence, gaining DPP at some stage this season. Swallow played one and a half games of NEAFL football in 2016 after returning from his knee injury late in the season. In all six quarters, Swallow sat as the loose man in defence, accumulating a total of 26 touches and ten marks throughout. His move to defence may merely have been to ease him back into the rigors of top football though it may also be to signal a possible position change – it’s really anyone’s guess. At AFL level, the Suns lack a potent ball user across half back; one who truly controls the game from defence. David Swallow could be that man. Round 15 2015 – Gold Coast hosted the Western Bulldogs in Cairns. That was David Swallow’s last game at AFL level. Since then, he has missed 30 consecutive of the Suns’ games. Should he return fit and play Round 1, there’s no knowing what to fully expect from him. If we have learnt anything from the past three years, it’s that having multiple long term injuries at the Gold Coast isn’t ideal. If Jaeger O’Meara somehow is fit for Round 1, Swallow’s relevance drops even further. Not only is he a better fantasy prospect, he’s a better footballer as well, and while he may take some time to adapt to Hawthorn’s match day environment, he still is less of a concern than Swallow may be. When I wrote about Brayden Fiorini earlier in the frame, I touched on Gold Coast’s Round 9 bye. With the bye earlier than other teams, coaches are going to have to take a donut during that week or hope a rookie gets called up. Transversely, it is an extra player coaches will have across all three of the other bye round where the Best 18 rule is in play. Whether you see it as a positive or a negative, it’s still certainly something to consider when picking any Gold Coast or Port Adelaide players in your team. JACK – Let’s say O’Meara isn’t fit come Round 1; Swallow is the best medium priced midfielder in AFL Fantasy. With his priced set at an averaged below 60, Swallow should beat that score every day of the week. Even if he only averages in the low 80s, he’s still bound to make coaches some serious coin, and with a potential DPP change on the cards, maybe, he could just be too good to ignore. Is David Swallow a mid-priced option for your squad? FOLLOW ME ON TWITTER: @AntWingardFP for all thing AFL Fantasy (and more). Got something to say about the deck? Use the hashtag… #DeckofDT. Matt, having round 9 players in your team won’t give you a “donut” in round 9. It just means that they will need to be replaced with an emergency. Your probable 80 may become 60 but it’s not a donut. Swallow is in my side atm and will stay there unless he gets injured between now and round 1. Is far too cheap not to take. Absolutely right Bandicoot. You’re far more likely to have decent cover in Round 9 when you only have to replace a couple of guys, than you are during the MBR’s. Someone convince me as to why I should pick him over Selwood! Good write up Anthony. As with many or the returning from injury players, I think it had to be a wait and see with the preseason games. My question is how many mid-pricers in the midfield is too many? I think you should not have more than one per line. And it depends why they are mid priced is it injury or are they wannabes ie with new position or role or team all risky – point being if a 350k guy can score 85 each week is that better than a 150k guy scoring 75? Selwood can play a tagging role sometimes……. 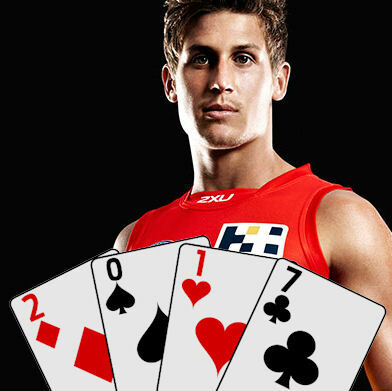 so did Coniglio in 2016 (and looked VERY Selwood-esque in doing so)… remind me how he went again? Selwood did in the couple games he played last year, and still scored very well! Scooter’s 107 year was as a full time tagger, just means he gets double figure tackles. Selwood by a mile, best average of 93 isn’t great in the mids and I’d spend the extra $25k in the hope of an actual keeper, and he actually strung some games together at the end of last season. And as someone who owned him in 2014 even as a Def those 70s were way too frequent and frustrating as you omitted there were six of them, he was almost tradeable as a defender, would be a massive weight in the mids. I guess they lost their entire midfield since he last played so he might be thrust right into it but the r9 bye, risk, lack of proven history and inconsistency put him miles below Scooter. Best thing he could do is copy O’mera and miss a month so as to be a rookie side trade r3-5. I will have both he and Scooter and will then be changing one of them to O’Meara later in the year. Rd 9 byes are a positive, We’re going to have players missing across the byes….why not have them where they can do the least damage? Its a huge positive that PA and GC have a bye week by themselves! It means that we will have them for the 3 weeks of carnage!